Payment Instructions: Successful bidders must contact the auction company within 24 hours of the auction's completion to verify method of payment. All payments must be made by credit/debit card (up to $5,000), by wire transfer, cash or cashier’s check. No personal or business checks will be accepted. Any outstanding balance must be paid within two (2) days of Auction Sale’s completion. An invoice will be sent to your email address registered with Proxibid after the auction's completion. All Items are sold "As Is, Where Is" with no warranties or guarantees. Note: A 23% Buyers Premium and a 2.5% Internet Service Fee will be charged on all items sold for up to $10,000 and paid for by credit/debit card. An 23% Buyers Premium and a 2.5% Internet Service Fee will be charged on all items sold for over $10,000 and paid for by credit/debit card. A 20% Buyers Premium and a 2.5% Internet Service Fee will be charged on all items sold for up to $10,000 and paid for by cash, cashier's check/money order or wire transfer. An 20% Buyers Premium and a 2.5% Internet Service Fee will be charged on all items sold for over $10,000 and paid for by cash, cashier's check/money order or wire transfer. Internet service fees are capped at $750 per item. All items not paid in full within three (3) days of the Auction will be subject to a 2% Late Fee. Removal of all items Purchased must be complete within seven (7) days of the Auction to avoid a $25 per item per day storage fee unless arrangements for storage have been made in writing from the seller or storage area owner. No items will be released until all items purchased by a bidder are paid in full. After 30 days or expiration of a storage agreement any items that have not been removed will be considered abandoned and resold with no refund to the buyer. All successful bidders will be charged applicable sales tax based on the address used to register for the Auction. Shipping Instructions: Buyers are responsible for arranging their own packaging and shipping. Please contact the auction company for general shipping and handling information. Driving Directions: From Interstate 5 - Take Exit 306A (Columbia Blvd. ), Turn West on to Columbia Blvd. (following the signs toward "Terminal 4"), Travel 5 miles on Colubia Blvd., Arrive at 9635 N. Columbia Blvd. on your right. From Portland International Airport - Depart toward NE Airport Way (0.2 mi), Keep straight onto NE Airport Way (1.1 mi), Turn right onto NE 82nd Ave (0.5 mi), Turn right onto NE Alderwood Rd (0.9 mi), Turn right onto NE Columbia Blvd (9.1 mi), Arrive at 9635 N Columbia Blvd on your right. 1. 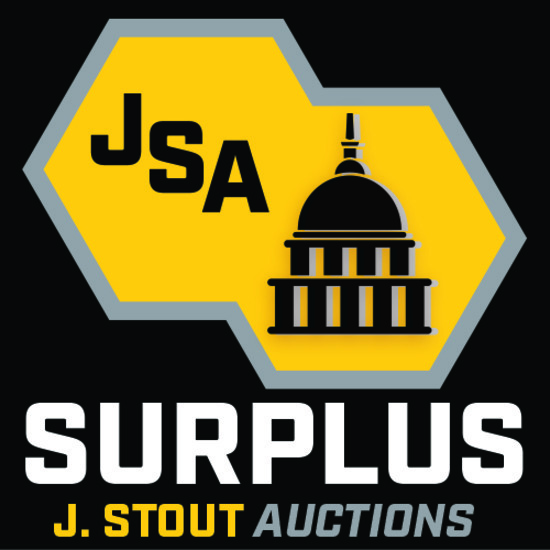 J Stout Auctions, a division of J. Stout Enterprises, LLC (the “Auctioneers”), hereby grants to the party whose signature appears on the Bidder’s Registration Agreement (the “Bidder”), the right to use the number (“Bidder Number”) shown in this Agreement for the purpose of bidding at Auctioneers’ Auction Sale. Such right is granted at the Auctioneers’ sole discretion and may be revoked at any time, with or without cause. 2. Bidder agrees that it has received, read and understands these Terms, a copy of which is printed on the inside cover of the Listing Catalog, as well as any other terms and conditions in this Listing Catalog, and agrees to comply with and be bound by them. Online bidders may request a copy of these Terms via email. Requests should be sent to info@jstoutauction.com 3. Auction Sale shall be conducted by offering the auction items by lot (“Lot”), either individually or in groups. The Bidder offering the highest bid accepted by the Auctioneers shall be deemed the purchaser (“Purchaser”) of the offered Lot (“Purchase”). Purchaser may not retract its bid for any reason. Purchaser accepts a Lot upon a bid. All sales are final. 4. Bidder, whether acting as principal, agent, officer or director of an entity or otherwise, in any capacity, and the entity represented, both jointly and severally agree: (a)	To indemnify and hold harmless Auctioneers and its consignors (“Consignors”) from any and all actions, causes of action, suits, damages, costs and losses of any kind, arising from the Purchase or subsequent use of any item, or the attendance or participation of Bidder, his agents or employees, at the Auction Sale and/or on the auction site whether before, during or after the Auction Sale; (b)	To be responsible for the payment of the purchase price and taxes due on all Purchases made using the Bidder Number regardless of whether it is in the Bidder’s possession or not,**NOTE - Sales tax will be charged on all Purchases at the rate applicable for the address used to register for the auction. **; (c)	All rights and defenses available to Auctioneers under this Agreement will extend to the Consignor. 5. These Terms shall be governed by and interpreted under the laws of the State of Washington without giving effect to any of the principles of conflicts of laws or the United Nations Convention on Contracts for the International Sale of Goods. Any action arising from or relating to these Terms or any bid or Purchase hereunder shall take place in a State or Federal Court in Clark County, Vancouver, Washington, and Bidder irrevocably consents to the exclusive jurisdiction of such courts. 6. The Auctioneer may at its sole discretion require Bidder to provide a deposit as a condition of being registered to bid. The deposit shall become non-refundable when Bidder makes a Purchase. At Auctioneers’ sole discretion, the deposit may be applied against any Bidder Purchase. Bidder hereby grants Auctioneers a security interest in the Purchases to secure payment of the purchase price. In the event of non-payment by Bidder, Auctioneers may file the Bidder Registration Agreement as a Uniform Commercial Code (UCC) financing statement to perfect Auctioneers’ security interest granted by this Security Agreement. 7. Auctioneers make no guarantees or warranties, expressed or implied, statutory or otherwise of any nature whatsoever regarding the Lots offered at the Auction Sale. Each and every Lot shall be sold “AS IS, WHERE IS”. Specifically, but without limitation, Auctioneers make no representation or warranty that any of the Lots: (a)	conform to any standard in respect of safety, pollution or hazardous material or to any standard or requirement of any applicable authority, law or regulation, or (b)	are fit for any particular purpose, or (c)	are merchantable or financeable, or (d)	are of any particular age, year of manufacture, model, make or condition or that the items (including Hour Meters and Odometers) in any Lot are operable. Bidder agrees he/she is not relying on Auctioneers, nor is Auctioneers liable, for any matter described above. Bidder further agrees to repair, at his/her sole cost, any Lot purchased at the Auction Sale to a safe operating condition and, without limitation, to a condition which meets any standard or requirement of any applicable authority, law or regulation. This includes for any use to which Bidder may put the Lot. 8. Bidder understands and agrees that an auction site is a potentially dangerous place. Flammable, noxious, corrosive and pressurized substances are present, heavy equipment is being operated and electric circuits may be live. Every person at the auction site at any time, shall be there at his/her own risk with notice of the condition of the premises and the activities taking place and Bidder will advise his/her agents and employees of such risks and activities. All persons waive the right to file any claims related to, and agree to indemnify and hold harmless, the Auctioneers and the Auctioneers owners, members, managers, employees and contractors from any and all claims for any injuries sustained, damages to, or loss of property which may occur from any cause. 9. If the Bidder registered for this Bidder Number has registered at this auction under other Bidder Numbers, all purchases under all Bidder Numbers shall be considered for the purposes of interpreting the Terms, as if purchased under a single Bidder Number. •	EVERY ITEM SOLD “AS IS - WHERE IS”. •	NO GUARANTEES OR WARRANTIES WHATSOEVER. •	PLEASE INSPECT THE EQUIPMENT BEFORE BIDDING. •	ALL SALES ARE FINAL 10. Auctioneers, at any time, and at its sole discretion, without notice or liability to buyer may: (a)	withdraw or cancel the sale of any Lot, or (b)	offer any Lots in groups or with privilege. 11. No person will bid on any Lot: (a)	of which he is the Consignor; or (b)	as agent, associate, or on behalf of the Consignor. 12. Auctioneers, in its sole judgment, will settle any dispute regarding any bidding. Auctioneers may put the Lot in dispute up for sale again. Auctioneers reserve the right to refuse any bid they consider to be an insignificant advance over the preceding bid. 13.Responsibility and risk for all Purchases will transfer to the Purchaser upon acceptance of his/her bid. Purchaser is responsible for insuring his/her purchases immediately. Under no circumstances will Auctioneers be responsible for loss or damage to any Purchase, even if Purchaser has not taken possession of the item. 14. All purchased Lots shall be subject to an administrative fee of (a) 20% on all lots selling for $10,000 or less, and (b) 20% on all lots selling for over $10,000. 15. All payments must be made by credit/debit card (up to $5,000) or by wire transfer, cash or cashier’s check. No personal or business checks will be accepted. Any outstanding balance must be paid within two (2) days of Auction Sale’s completion. Payments received on account of this or any other Auction Sale may, at the Auctioneer’s discretion, be first applied to prior outstanding accounts. Purchases shall not be released until all accounts are paid in full. At Auctioneers’ discretion, any proceeds due to Purchaser under a Consignment to Auction Agreement may be set off against any outstanding accounts. All payments made by credit card shall be subject to a processing fee of 3% of the purchase price. Additionally, for any Purchase made through the use of the Auctioneers’ online auction site, the Purchase shall also be subject to an additional 2.5% internet convenience fee with a maximum fee of $750. Such convenience fee is in addition to all other fees described in this Agreement. 16. Purchaser shall not be entitled to possession of any of his/her Purchases until the total purchase price of all his/her Purchases including all applicable goods, fees, sales or use taxes, has been fully paid. If Purchaser fails to pay the amount due as required under this Agreement, or fails to comply with any Terms, Auctioneers will retain a possessory lien on all of Purchaser’s Purchases. Also, Auctioneers’, at its sole discretion, will have the right to resell such Purchases by public or private sale without prior notice to Purchaser. Should Auctioneers resell any Purchase, the net proceeds from such sale (after deducting commission of (a) 15% on Lots reselling for more than $2,500; (b) 25% on Lots reselling for $2,500 or less with a minimum commission of $100 per Lot; (c) any costs; and (d) payment to Consignor for the original purchase price of the item) shall be credited to the original Purchaser’s account and the original Purchaser will upon demand pay Auctioneers, as damages, any deficiency arising from the resale including, but not limited to, any amounts owed to Consignor for Purchaser’s initial purchase of the item at the auction sale. 17. Purchaser must remove all Purchases from the auction site within seven (7) days of the end of the Auction Sale and Purchaser will solely bear all costs, responsibility and risk of such removal. Auctioneers reserve the right to require proof of adequate insurance coverage from any Purchaser for Purchases requiring dismantling, rigging or hot cutting. If for any reason Purchaser fails to remove any Purchase within seven (7) days of the end of the Auction Sale, the Purchase shall be subject to storage charges in the amount of FIVE HUNDRED DOLLARS ($500) per day for each item purchased, and may be deemed abandoned by the Purchaser. If Auctioneers deem an item abandoned, Auctioneers, at its sole discretion, may resell the Purchase pursuant to Section 16 above, or remove and store the said Purchase at Purchaser’s sole risk and expense. Purchaser shall be liable for any rent incurred or damages suffered by Auctioneers because of Purchaser’s failure to remove any Purchase in a timely manner. 18. Listing Catalog is only a guide, and is based on information from sources believed to be reliable and from the Consignor. However, its accuracy cannot be guaranteed or warranted. No sale shall be invalidated nor shall Auctioneers be liable for any damages or expenses as a result of defects or inaccuracies in the Listing Catalog, including but not limited to Odometer and Hour Meter Readings. Bidder agrees that all Lots were available for inspection prior to the Auction Sale and that it is his/her sole and ultimate responsibility to inspect all equipment and to make his/her own inquiries prior to bidding. 19. All necessary documents, if such documents exist or are available, shall be delivered immediately to Purchaser upon payment in full as set out above, or shall otherwise be mailed within seventy-two (72) hours of Auctioneers receipt of such documents from the item’s Consignor, and provided that Auctioneers have received payment of the purchase price in full and without any restrictions or holds on said funds. Documents shall only be effective in the legal jurisdiction in which the Auction Sale is being conducted. 20. If, for any reason, Auctioneers are unable to make available or deliver any Purchase or clear title to the same, or documentation required in respect of any Purchase, whether before or after delivery, Auctioneers’ sole liability, if any, shall be the return of monies paid in respect of such Purchase upon Purchaser’s return of the Purchase to Auctioneers in its original condition (at the time of Purchase). Any Purchase, for which clear title cannot be provided, shall be returned and surrendered to the Auctioneers upon demand. 21. Purchaser will pay Auctioneers interest on overdue amounts at a rate of 1.5% per month or at such other maximum rate as allowed by law, together with all legal or collection costs incurred by Auctioneers. 22. (a) If a Purchaser claims an exemption based on goods being shipped out of state for use out of state, then the goods must be delivered to and shipped by a common carrier. (b) In such case, Purchaser will arrange for and assume all risks and costs associated therewith. 23. Bidder consents to Auctioneers using the information provided in the Bidder Registration Agreement for internal marketing purposes and to assist the Auctioneers in refining and improving its services. All information shall be retained in accordance with the Auctioneer’s Privacy Statement, available at www.jstoutauction.com 24. The parties agree to attempt to settle any disputes under this Agreement through good faith negotiation. For the duration of and after the conclusion of the auction, Bidder agrees not to make disparaging or defamatory comments about Auctioneers or its officers, owners or employees to any third party without first bringing the issue to the attention of Auctioneers and allowing Auctioneers to resolve the issue with Bidder through negotiation. This includes verbal comments, comments in print or through the Internet, including but not limited to, Facebook, Twitter, Snapchat, Google, LinkedIn, Yelp and Instagram. Because violation of this clause by Bidder could cause irreparable injury to Auctioneers, this clause may be enforced by an action for injunctive relief in addition to other remedies available to Auctioneers. 25. No waiver by Auctioneers of any breach, default, or violation of any term in this Agreement will constitute a waiver of any subsequent breach, default, or violation of the same or other term of this Agreement. 26. These are the complete Terms and may not be amended except by agreement in writing signed by Auctioneers and the respective Purchaser. You've been outbid by D****W! by YOU! You've been outbid by J****k! by YOU! You've been outbid by c****s! by YOU! You've been outbid by e****d! by YOU! You've been outbid by i****y! by YOU! You've been outbid by s****8! by YOU!